Laurel has been passing the time since her mother's death trying to cope and heal at Avondale School, her new boarding school and her mother's alma mater. On her fourteenth birthday, she receives a letter from her mother and mysterious bouquet of flowers that seem to ignite her special, intense feelings near flowers, and slowly she discovers her ability of Flower-speaking—magically enhancing the meaning of flowers to influence the lives of people around her. Laurel is giddy to discover her ability, an art that brings her closer to her mother, but she is still unskilled, and in a school full of girls, emotions and magic can spin out of control rather quickly. Amy Brecount White has taken an intriguing Victorian art and given it a modern, magical spin in Forget-Her-Nots. The book is brimming with history and flower knowledge and meanings, which adds to the novel's appeal and sets it apart from other novels of its sort. Though Laurel is still grieving for her mother, she is also starting a new phase in her life at high school by learning to fit in and by making friends and crushing on a guy from the next school over, and it those details that make Forget-Her-Nots more relatable to its readers, and the magical and creative use of flower meanings make the book unique and fun. There are a lot of simple, but important lessons that go along with growing up in this novel, like learning to confront your issues on your own, dealing with mean people, and learning to hold on to the good memories while moving on that readers can appreciate. Along with the lively cast of characters dialogue and mishaps and triumphs with Laurel's ability, Forget-Her-Nots is a wonderful, light read for younger teens. Cover Comments: I like how soft and pink and pretty this cover is--very nice! 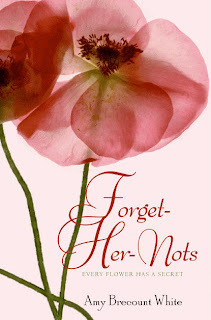 Forget-Her-Nots will be released on March 2nd, 2010! This is on my TBR list! Hopefully it's as good as it sounds! Thanks for the great review! I really want to read this book and I absolutely adore the cover!